The benefit of this kind of thinking that support and resistance lines are not flat lines is that, it prepares us to expect nothing of a breakout because that breakout point may disappear since the support and resistance lines in ichimoku is not a flat line. The tenkan sen line can be thought of as a light resistance. A trend may hit the tenkan sen lines a couple of times and break. It can also serve as an entry point for traders who wants to get in on the trend after a small retrace. 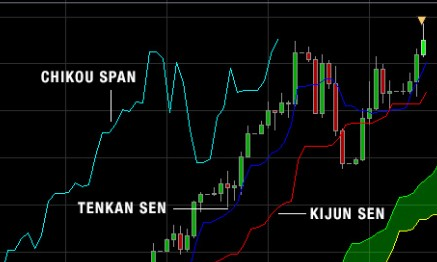 The tenkan sen can also be an indicator of trend direction, when the price is trending, or it is about to trend, the tenkan sen will point to the direction of the coming trend or prevailing trend. In other words, it points up if it wants to trend up and down if it wants to trend down. If flat, there’s a consolidation and the trend may reverse. Keep in mind that I said earlier that the tenkan sen is a light resistance. And it is true for the trend it indicates. The trend may be weak when indicated by tenkan sen. It is the short term indication of the trend and the light weight of support and resistance. When Tenkan sen is the lightweight, kijun sen is the heavyweight. When price reaches for the kijun sen, its a strong support and resistance. And breaking the kijun sen will result in a reversal of the trend most of the times. A false break out of the kijun sen will result in a strong continuation of the trend. The proper use of kijun sen is for entry. When price reaches for the kijun sen, its a good probability to add position or enter the trade. That is, if you’re a trend follower. For the contrarian, its a good position to bet on the other side of the trend. The Kijun sen also points up, down and flat. Same thing as the tenkan sen lines. But keep in mind that the kijun sen is a heavy weight and the indication is that the trend will continue for med to long term. There are many description to define Chikou. Some traders I know ignore it altogether. But I think, Chikou is very important. It is the momentum of the trend. The chikou also gives you the direction of the trend. When it points up, down and flat is the same with the kijun and tenkan sen lines. What’s unique about chikou is that it gives you another indication. Where it is placed on the chart has an impact. When the chikou collides with the price action candle stick, it means, its consolidating. When the chikou is below a price action candle stick, it means its bearish. When chikou is above price action, its bullish. When its inside a cloud (we will explain cloud in later posts), it is consolidating. And when the chikou is free to roam, no cloud, no price action to collide with, then the trend is strong, and will probably last for a very very very long time. The key to using these lines is to look at them all and how they behave. On the next post, we will discuss how all these 3 lines act together to give you a well informed representation of a good probability trade. This entry was posted in Forex Analysis, Forex Basics by ForexPhil. Bookmark the permalink. Great article! May I know what time frame you usually use in trading using this indicator? Or are you using a multiple time frames?